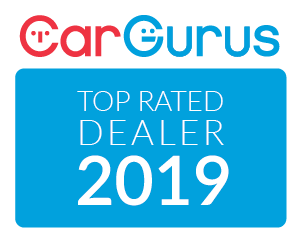 Woodbine Nissan | Blog | Considering a 2019 Nissan Rogue, Honda CR-V or Toyota RAV4? 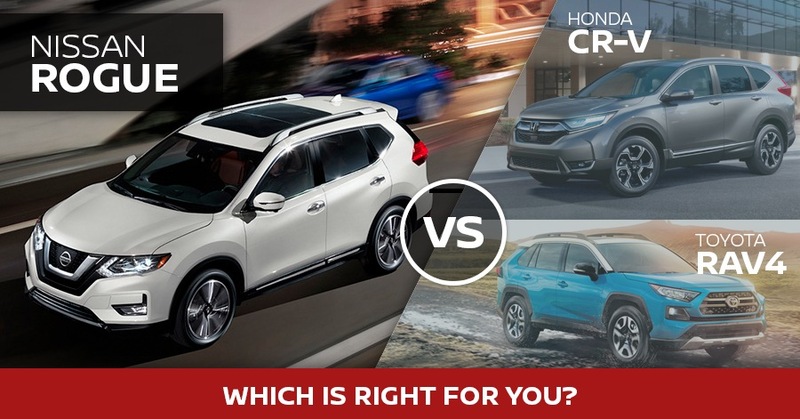 Considering a 2019 Nissan Rogue, Honda CR-V or Toyota RAV4? The compact crossover segment is arguably the most competitive on the market today. Every manufacturer has a contender with its hat in the ring. The question is, which choice is right for you? Three of the best and brightest are the Nissan Rogue, Honda CR-V, and Toyota RAV4. All three models offer versatility, safety, and efficiency. However, one model in particular blends all the right factors and does so at an affordable price: The Nissan Rogue. Considering the Rogue, CR-V, or RAV4 for your next vehicle? Learn how the Rogue stacks up against other SUVs and why it offers more WAY more bang for your buck. The Nissan Rogue has all the essential qualities you look for in a small crossover, including superior comfort, high-level safety scores, and tons of room for passengers and cargo. With 1982 liters of cargo space, the Rogue is easily one of the more versatile small crossovers on the market. Plus with a luxurious cabin and a host of standard and available features, the Nissan Rogue brings more to the table than its competitors and does so for far less. When comparing the Rogue, CR-V, or RAV4, it’s fairly easy to see the Rogue is the clear front-runner when it comes to value. The Rogue has a starting MSRP of $26,798, while the RAV4 starts at $27,990 and the CR-V starts at 27,490. The Rogue is clearly the more affordable crossover and stays so as you move up the trim levels. At the top trim level, the RAV4 continues to be more expensive than the Rogue. The top-end Rogue SL with ProPILOT assist starts at $37,398 while the RAV4 Limited Hybrid costs around $42,090. As for the Honda CR-V, expect to shell out even more at the top-end with the Touring trim setting back buyers $38,890. While all three crossovers are evenly matched in features and interior space, the Rogue is the BEST bang for your buck. Why? At every trim level, the Rogue costs you less, with savings up into the thousands! Another way the Rogue saves you money? Fuel economy. With a rating of 7.1 L/100 km on the Highway, the Rogue S is more efficient than the CR-V LX which has a rating of 8.0 L/100 km and matched with the RAV4 LE AWD at 7.1 L/100 km. A better fuel economy means you save more money on gas, adding to the long list of added values the 2019 Rogue offers prospective buyers. And with a rating of 9.1 L in the City, the Rogue is one of the best crossovers on the road right now for fuel standards. Right now at Woodbine Nissan, lease a 2019 Rogue S for just $65 weekly for 39 months (with $2,695 down) with an additional $1,100 Autoshow Bonus! PLUS earn an additional $1,000 in AWD Cash or get your first 3 lease payments on us! Book a test drive online today or visit us in person at 60 Queens Plate Drive Etobicoke, ON M9W-OC7!